I have just finished reading the most amazing book on the USSR I think I think I have ever read. Most of what we read on the topic is either dry analysis or books taking the stance that this system was always meant to fail because of the inherent stresses within it. This book does show those stresses and dichotomies, but from the point of view of people actually living them. It also shows that the system was not always meant to fail - but that attempts to make it work were hampered by the bureaucrats and those who profited from it. Not to spoil the book for you (and to give a dry analysis of it!) - it is a novel based on real events with people who existed as characters plus some fictional "composite" characters. It traces the history of "scientific socialism" and how people thought that all could be provided by a huge industrial monster really, a monster that had inflexibility built in-and hence the seeds of its own destruction. The book traces the triumphs and optimism of the early system with output surpassing that of the USA, and the promise and ultimate failure of the Kruschev era, and the falling into Breznev stagnation. The real sadness is that at nearly every part of the system, they believed it would work, but ultimately they were hampered by bureaucracy and bureaucrats and people who decided that the "greater good" was to defend the failing system by denouncing those who could have fixed it as dissidents etc- and worse, even in Kruschev's day resorting to shooting striking workers. 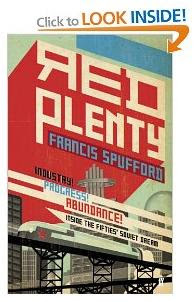 It shows the difficulty of emerging from the Stalinist era of austerity and forced work, to one of openness and plenty. It also shows the corruption of those at the top and in the middle who like in all political and economic systems, control and walk over others in order to hold on to their bit. The characters are not the cartoonish USSR era people we see with in other writing and representation of the period nowadays. All are in some way part of their system - even the dissidents want socialism to work but are hampered by those who are profiting from the system - or are simply afraid of change. Discussion, debate and experimentation closed down by "correct line" argument. This book gives a view of the Soviet Union in a way that the West has analysed and presented 1950's-60's USA. It is a place of hope and a place were people lived out their lives through struggle and through political and personal discourse, not all marching to the Stalinist or McCarthy-ist drum beats.